Sister and brother Tess Booth and Travis Booth won in their respective divisions against J Serra. 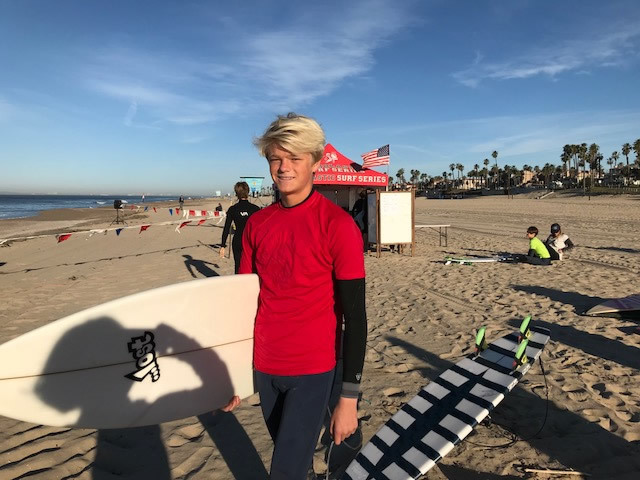 Members of the LBHS surf team, some competing in multiple divisions, earned spots in the individual finals in all four divisions in a Huntington Beach competition last week. LBHS surfed against J Serra and won 63 to 25. Once the individual competitions began, LBHS surfers stood out with Travis Booth, Liam McCue and Jackson Jenkins advancing to the finals in short board. In the final, Travis continued to shred a number of lefts and rights and was on top of his game taking the overall win. He did double duty and took third in body board. Jackson Jenkins took the win overall in long board. Liam had some impressive rides and finished runner up. Jackson, also in multiple divisions, took the win overall in long board and fourth in in short board. Jameson Roller was a standout in several heats in long board and finished fourth. Tess Booth continued her run competing in both short board and long board to took wins in both. Jade Howson took second in long board and Kelly Smith took third in short board. Other surfers competing were Sam Starr and Joseph Schenk. The next Scholastic Surf Series event is scheduled for Feb. 11 at San Clemente Pier. Girls work on their passing skills prior to club basketball league tryouts. 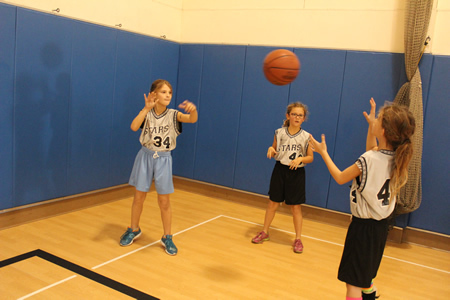 Registration is open for the girls spring basketball league at the Boys & Girls Club. The cost for club members is $150 per player and includes a new uniform. Non- members pay $150, plus yearly club membership of $100. Registration continues through Feb. 28. Scholarships are available for qualifying families. Player evaluations are mandatory and will be held the week of March 5-8. One-hour practices begin March 26, and games will start on April 10. Players in grades K-9 will learn basketball skills and teamwork.